The form automatically fills in your personal information. To make changes, you will need to go to Home. You can manually add the event by entering the appropriate text into the field. Ensure the Event Name/Funding Reason is correct so the reviewer can verify the dates and so on. If you are claiming for an event where attendance was taken and electronically recorded by the Provincial Office, the event is included in the drop-down menu. The menu is only available for events where your status is recorded as Attended in the DMS. This is done by the Education Department using the sign-in sheet after the event has been completed. 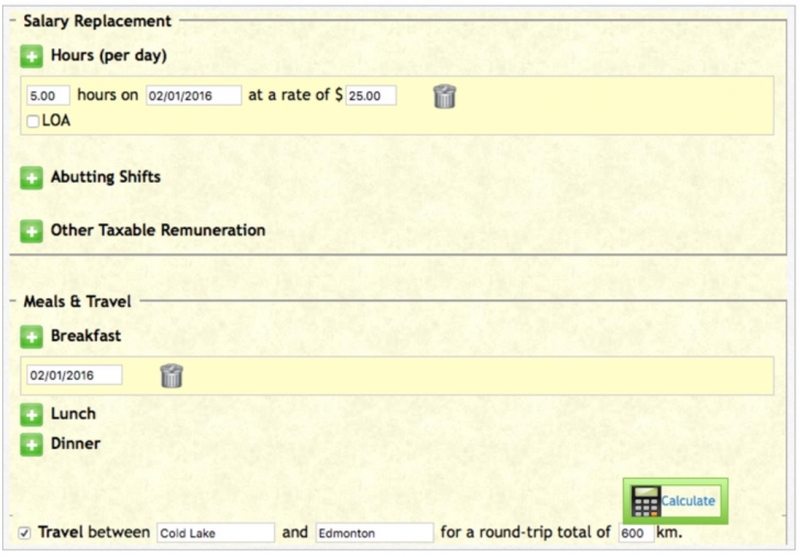 To complete the Salary Replacement options, you will need to use the Plus button to enter Regular Shifts and, if needed, an Abutting Shifts entry. Other Taxable Remuneration is to be used if you are being paid a given amount of money rather than an hourly rate. The only entries that should appear in this section of the expense claim are those that involve actual money earned. All such earnings will include the need for CPP and EI deductions that are done for you by Centralized Accounting. UNA policy does not require receipts for claims on Meal & Travel or Salary Replacement. The distance calculator will appear only after you enter the starting and ending points of your travel. The calculator uses Google Maps to make a one-way calculation of the distance. Accommodations claims require a receipt. If you are using Direct Bill it is not necessary to included a receipt since UNA receives the actual bill. Other Items gives you a place to enter unexpected but necessary expenses and each requires a receipt. Receipts are given to the local treasurer for local expense claims and sent to the UNA Provincial Office in Edmonton for all provincial expense claims. Other items might include the purchase of a book during your workshop or a taxi or parking charge. 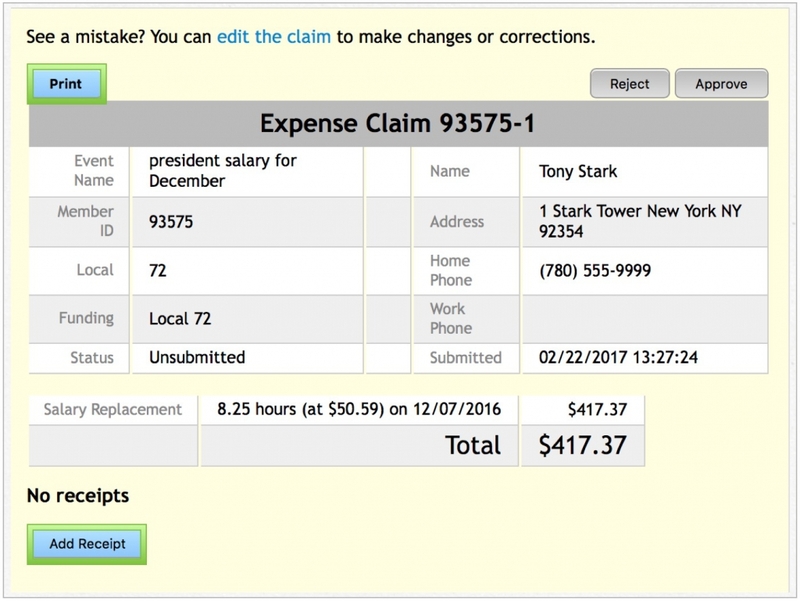 The line item is used for any claim where you have personally paid for some item or service and are requesting reimbursement. The drop-down menu includes UNA Visa if needed. This line item is given in a dollar amount as specified on the appropriate receipt. Use one line for each item and ensure the receipt for each is included with the claim. The form starts out with Local, Provincial or District. This can be changed by clicking on the alternate funding option. Do not change unless funding needs to be changed. You can ignore the value displayed beside the word District unless you are filing a District Claim. Submitted locally funded claims are accessible by your Local Treasurer for review. Provincially funded expense claims are accessible by Provincial Accounting for both review and payment. If an error is found the form is rejected. Any form can be edited (click on the Pencil) until the receiver changes the status to Approved. If your money is to come from some other local, change the number that appears to reflect the change. This lets the system submit the claim to the required local. You might want to add an instruction into the notes field with special directions. This will clarify to Centralized Accounting that your local change was authorized. The claim will be approved by the treasurer of the local being used. Once the form is complete, use the Submit Claim or Save As Draft button. If you do not use one of the two options, your form will disappear once you move to a new location in DMS. Submitting or saving a draft moves the form from the calculation format to final format. If you need a paper copy, use the Print Button. If you have receipts, attach them to the printed claim form for submitting to your Local Executive or to Provincial Finance. If you are submitting a Provincial expense claim, you may scan the receipt to PDF format and submit via email. 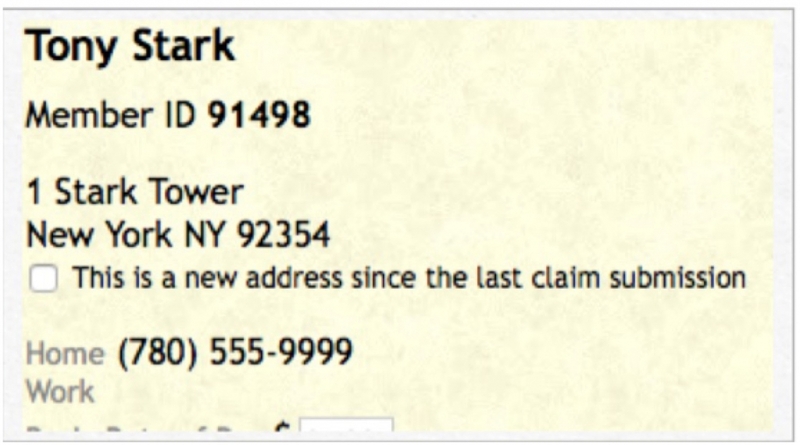 However, be extremely careful to clearly identify the appropriate claim form number.